Tarō Kōno (河野 太郎, Kōno Tarō, born January 10, 1963) is a Japanese politician belonging to the Liberal Democratic Party. He is a member of the House of Representatives, and has served as Minister for Foreign Affairs since a Cabinet re-shuffle by Prime Minister Shinzō Abe on 3 August 2017. Tarō Kōno was born on January 10, 1963, in Hiratsuka, Odawara, the oldest of the three children of Yōhei Kōno, a former President of the Liberal Democratic Party and Speaker of the House of Representatives. He was born into a family of politicians: his father, his grandfather Ichirō Kōno, and his great-uncle Kenzō Kōno (Speaker of the House of Councillors between 1971 and 1977), were all active in national politics. He attended Hanamizu Elementary School, Keio Middle School, and then Keio High School. In 1981, he entered Keiō University to study economics but quit after being told by his father he would have to do so if he wished to study in the United States. In 1982, he went to the United States, where he attended the Suffield Academy and Georgetown University, and studied comparative politics. In 1983, he worked for Senator Alan Cranston in his campaign for the Democratic Party presidential nomination. He also worked for Congressman Richard Shelby of Alabama for two years. He also spent time at the Warsaw School of Economics, Poland, during which he spent a night in prison after visiting the home of Solidarity leader, Lech Wałęsa. Kōno graduated from Georgetown University in 1985 with a Bachelor of Science in Foreign Service and the following year he joined Fuji Xerox. He moved to Fuji Xerox Asia Pacific in Singapore in 1991. In 1993, he joined Nippon Tanshi, a supplier of electric components for Toyota, GM, Matsushita, and other companies. Kōno was first elected to the House of Representatives of Japan as a Liberal Democratic member in the October 1996 general election, at age 33. He won a closely contested election in the newly created Kanagawa 15th district covering the cities of Hiratsuka and Chigasaki, adjacent to his father's constituency in the Kanagawa 17th district (Odawara and Hadano). He has since been re-elected six times, in 2000, 2003, 2005, 2009, 2012 and 2014. His winning majority increased from 13,297 in 1996 to 63,058 in 2000, 71,968 in 2003, and 103,280 in 2005. The total number of votes he received in 2005 was 186,770, the second largest number in Japan's electoral history (second only to then Prime Minister Koizumi's total in the same election). Kōno has been a member of five standing committees of the House of Representatives: Economy; Environment; Health, Labour, & Welfare; Trade & Industry; and Finance. In addition, he has been a member of two special committees: Consumer Affairs, and Children & Youth Affairs. In 2000, during his first term in the House, Kono approached Shinzo Abe, then in his second term, and offered to back Abe in a future LDP leadership run due to Abe's views on collective self-defense, which was then an unpopular notion in the Diet. From January to October 2002, Kōno was Parliamentary Secretary for Public Management, responsible for administrative reforms, local governments, and "e-government." From November 2005 to September 2006 he was Senior Vice Minister of Justice in Koizumi's government. In October 2002, Kōno was named Director of the Foreign Affairs Committee of the House of Representatives. He resigned from this position two months later in protest over the Iraq War, accusing Foreign Minister Kawaguchi of not adequately explained the government's policy. Kōno was the Acting Chairman of the Liberal Democratic Party Committee until November 2003 and was one of the few members of the LDP to oppose the dispatch of the Self Defense Forces to Iraq. In 2004, Kōno, then 41, was appointed Assistant Secretary-General of the Liberal Democratic Party, and was also elected Prefectural Chairman of the Liberal Democratic Party in Kanagawa Prefecture. He was the youngest Prefectural Chairman in the LDP. In 2005, he led the Party in Kanagawa in the general election. In 2004, Kōno co-sponsored the Economic Sanction Amendment to the Foreign Exchange Law, which gives the government power to unilaterally declare economic sanctions on any state; and the Port Closure Bill, which allows the government to refuse the entry of foreign ships from Japanese ports. His website states that "North Korea was the target." He also sponsored a United Nations Reform Bill that would have required the government to reduce its voluntary contributions to the UN Systems by 10 percent each year until changes were made in the membership of the Security Council. Kono resigned as head of the Kanagawa LDP following the 2007 local elections, in which the LDP-supported candidate Tadashi Sugino lost to incumbent Shigefumi Matsuzawa. He became head of the House of Representatives Foreign Affairs Committee in September 2008. He ran for President of the LDP in 2009, but was defeated by Sadakazu Tanigaki. Kono replaced Hiroyuki Sonoda as Deputy Secretary-General of the LDP in April 2010, after Sonoda left the party to join the Sunrise Party of Japan. 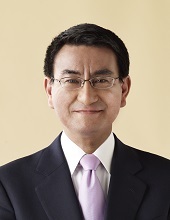 In October 2015, Kono joined the Third Abe Cabinet as Chairman of the National Public Safety Commission, Minister in charge of Administrative Reform, Minister in charge of Civil Service Reform, Minister of State for Consumer Affairs and Food Safety, Minister of State for Regulatory Reform and Minister of State for Disaster Management. In this role, he was responsible for coordinating security measures for the 2016 G7 summit. He left the cabinet in a reshuffle in August 2016. Abe named Kono Foreign Minister on 3 August 2017, replacing Fumio Kishida, who had served in that role since 2012 and had rarely publicly disagreed with Abe. Kono was chosen over Katsunobu Kato, after lengthy deliberation, for his superior English ability and his grasp of international issues, despite having a reputation as an outspoken and sometimes "eccentric" politician. Foreign media reports considered Kono to be more dovish compared to Abe, and expected him to take a softer diplomatic approach to foreign policy. Many analysts were particularly optimistic that Kono would adopt his father's friendly attitude toward China. As foreign minister, Kono was responsible for coordinating Japan's response to the North Korean crisis. He publicly urged countries to cut diplomatic and economic ties with North Korea following the announcement of enhanced sanctions by the US government in September 2017. Kono also reportedly pressed Iranian foreign minister Javad Zarif to increase Iranian pressure on North Korea. Kono's father publicly criticized the government's approach to the crisis, claiming that it should be more cooperative with the Chinese government. Late in the evening of the 15th of April 2018 in the flury of exchanges after the tripartite missile strikes on Syria, Foreign Minister Kono received the first official visit from the Chinese counterpart since November 2009. The Chinese Foreign Minister Wang Yi will be visited for several days in the leadup to Prime Minister of Japan Shinzo Abe`s visit to President Trump that month. Kono was the first Japanese FM to host an official Chinese FM visit for nearly a decade. Kono's past business, as well as political ties to the United States, make him very appealing to serve as Foreign Minister. Abe said of Kono appointment, “He has been to the United States many times and made friends there. He has also had exchanges with American politicians. I'm sure he'll serve (as minister) with an understanding of how to strengthen the Japan-U.S. alliance”. Prime Minister Abe has made it explicitly clear that by appointing Kono to the position of Foreign Minister, he was trying to strengthen the already formidable Japanese American alliance. Kono’s appointment to Foreign Minister has also been well received by Japan’s surrounding neighbors,” Some Foreign Ministry officials say the appointment of Kono will be viewed favorably by China and South Korea. Kōno is commonly dubbed as a "maverick" and known for expressing his views on politically sensitive issues. He established a House subcommittee on genetically modified organisms in 1997 and supported new labeling rules on GMOs. He opposes the government's nuclear policy, especially plans to pursue the nuclear fuel cycle and to build new power stations. Before serving as Foreign Minister, Kono was on record as saying he would like the Japanese Government to curtail its reliance on Nuclear energy going forward. He specifically opposed Government plans to build new nuclear reactors. Kono also believes Japan needs to be more prudent about the dangers of Nuclear Energy in the aftermath of the Fujiyama Nuclear Explosion by limiting the number of years already operational nuclear stations are free to operate, “Kono has said he wants Japan to commit to phasing out nuclear power by shutting down reactors when they reach 40 years of service, contrasting the government’s policy of maintaining its nuclear reactors as a core energy source”. Kono believes that Nuclear explosions and contamination are not the only dangers that result from Japan’s reliance on Nuclear Energy, “ "We've been depending on the nuclear energy so much,"... "It's not the policy choice. It's because of those bureaucrats and the power company and the politician got some vested interest in promoting nuclear". Following his appointment as Foreign Minister, on being on August 3, 2017, Kono has taken a partisan approach toNuclear Energy policies, “ Asked at his inaugural news conference Wednesday night whether he will retain his criticism of Abe’s nuclear policy, Kono said he was “going in the same direction” as his boss"
He has said that he would not visit Yasakuni shrine if he was ever made Prime Minister, although he visits the shrine at present because he has relatives who died in the war. Kono believes that the best way for Japan to limit political backlash from their surrounding neighbors is to build a new shrine, “Kono said he supported building a new national memorial to honor the war dead, saying it would make it easier for the Emperor and the prime minister to pay their respects”. Kono believes that building a new shrine will de-escalate tension from Japan’s neighbors over Japan’s prime minister visiting the current shrine, which honors 14 Class-A-War criminals. The Japanese Emperor does not currently visit Yasukuni Shrine. He supports amendment of Article 9 of the Japanese Constitution, allowing the Self-Defense Forces to engage in warfare. He supports the Japan-U.S. Security Treaty, but seeks revision of the Status of Forces Agreement (SOFA) On the issue of the U.S. Marine Corps Air Station in the Okinawan city of Futenma, Kono's "off the record" views "conflict with the official Japanese position." He opposes donation of development aid to any countries that have failed to ratify the Complete Test Ban Treaty. He has supported raising the consumption tax rate to 8 percent, with the funds to be directed towards the National Pension. Kōno advocates for more immigration, having criticized the government's resistance to opening the door to immigrants in order to mitigate Japan's labor shortage as a result of its aging and shrinking population. Taro Kono is considered to be an Asia-Centrist despite his strong ties to the United States. Taro Kono has long been an emphatic proponent of a reinvigorating the Korea and Japan alliance, “ We need an Asia-Centric policy that considers at the same time Japan's national interests and the interests of surrounding nations, and the focus of that is between Japan and Korea”. The fixation on Asia-Centrism by Kono is a direct dichotomy from most LDP politicians, who heavily stress Japan’s relationship with America. Kono would like to entwine a greater business and economic relationship between the two nations. Kono is on record as saying, “I understand the problem as one in which Korea and Japan must pool their strength so that they might survive in the changing global environment”. Kono believes that Japan and Korea must stick together in order to compete with the current economic superpowers of the world like the United States and China. Kono has taken several steps to forging a more vigorous relationship between Japan and Korea. Kono Co-Sponsored a bill which now allows direct air service between Gimpo, South Korea and Haneda airport in Tokyo Japan. Kono hopes that the direct flight between the two popular cities will make for easier travel by businessmen voyaging between the nations. Kono hopes that the less restrictive travel process will give rise to increased commerce between the two nations. Kono, however, still believes there is much more work to be done to help generate more commerce between the two nations. Kono would like to see the extension of short terms visas up to three months from Korean nationals doing business in Japan. He is the only Japanese lawmaker who runs a Korean webpage, and provides internships to Korean nationals. One of his Korean interns went on to become the Consul-General of South Korea in Kobe. Kono has neither endorsed nor rejected his father's famous Kono Statement, which acknowledged the Japanese military's use of comfort women during World War II. Kōno is married to Kaori, a returnee from Australia, and has a son, Ippei, born in 2002. The couple enjoy scuba diving and going to the movies. He has become involved in a number of bodies managing professional sports. He is Chairman of Shonan Bellmare, a professional football club, and of the Japan Race Horse Association, which organizes Japan's largest yearling sales. He is also President of the Kanagawa Triathlon Union, the Kanagawa Track and Field Association, and the Hiratsuka Baseball Association. He teaches a graduate class at Hosei University. In 2002, when Yōhei Kōno fell ill from a 30-year-old hepatitis C infection, Tarō Kōno offered a part of his liver for donation. This led to a public argument, as his father refused the offer. Eventually his father accepted, and in April 2002, Tarō Kōno donated part of his liver in a 15-hour operation. Kōno has since supported changes to the law regarding organ donation. In the 2003 Lower House Elections, Taro Kono received 125,067 votes, which accounted for 55.4 percent of the votes cast in his district. In the 2005 Lower House Elections, Taro Kono won 186,770 votes, or 63.9 percent of the votes cast in his district. In the 2009 Lower House Elections, Taro Kono received 163,470 votes, which was good for 53.3 percent of the votes cast in his district. Kano has fared quite well in his last two elections, winning re-election by overwhelming margins. In 2012, Kono received 192,604 votes winning over eighty percent of the vote in his district. This is an overwhelming margin of victory. In 2014, Kono did not win by quite as large of a margin. In 2014, Kono received 155,388 votes, which yielded him 68 percent of the vote in his district. Nevertheless, Kono received a large number of votes and won elections by sweeping margins. ^ "Abe picks maverick as foreign minister in move to refresh Cabinet image". Mainichi Daily News. 2017-08-04. Retrieved 2017-08-04. ^ a b c "プロフィール". 衆議院議員 河野太郎公式サイト (in Japanese). Retrieved 2017-10-18. ^ a b c d "Taro Kono as Foreign Minister: Is He Abe's Trump Card to Have the 'Kono Statement' on Comfort Women Revised?". Japan Forward. 2017-08-07. Retrieved 2017-10-18. ^ a b c d e f "A maverick at home, Japan's Taro Kono set for softer diplomatic approach abroad". Reuters. 2017-08-03. Retrieved 2017-10-18. ^ "China, S. Korea media welcome new, dovish foreign minister：The Asahi Shimbun". The Asahi Shimbun. Retrieved 2017-08-04. ^ Gao, Charlotte. "Are China and Japan Moving Towards a Rapprochement?". The Diplomat. Retrieved 2017-10-18. ^ "Japan Foreign Minister Taro Kono urges countries to cut ties with North Korea". The Straits Times. 2017-09-22. Retrieved 2017-10-18. ^ "Overheard at UN: Japan Asks Iran for Some Help on North Korea". Bloomberg.com. 2017-09-22. Retrieved 2017-10-18. ^ "Japanese foreign minister on back foot after policy criticised by father". South China Morning Post. Retrieved 2017-10-18. ^ “Abe Picks Maverick as Foreign Minister in Move to Refresh Cabinet Image.” The Mainichi, 4 Aug. 2017. ^ Abe made it explicitly clear that by appointing Kono to the position of Foreign Minister, he was trying to strengthen the already formidable Japanese-American alliance. Kono’s appointment to Foreign Minister has also been well received by Japan’s surrounding neighbors,” Some Foreign Ministry officials say the appointment of Kono will be viewed favorably by China and South Korea 3". ^ a b Sieg, Linda, and Kiyoshi Takenaka; “A Maverick at Home, Japan's Taro Kono Set for Softer Diplomatic Approach Abroad.” Reuters, Thomson Reuters, 3 Aug. 2017, www.reuters.com/article/japan-politics-kono/a-maverick-at-home-japans-taro-kono-set-for-softer-diplomatic-approach-abroad-idUSL4N1KP140. ^ Kuhn, Anthony. “Public Anger Against Nuclear Power Mounts In Japan.” NPR, NPR, 31 Mar. 2011, www.npr.org/2011/03/31/135008910/public-anger-against-nuclear-power-mounts-in-japan. ^ “New Minister Kono Now 'Going in Same Direction' as Abe on Nuclear Policy.” The Japan Times, www.japantimes.co.jp/news/2015/10/08/national/politics-diplomacy/abe-nuclear-policy-critic-kono-newly-appointed-minister-now-going-direction-boss/. ^ “Presidential Candidates Call for LDP Makeover.” The Japan Times, www.japantimes.co.jp/news/2009/09/20/news/presidential-candidates-call-for-ldp-makeover/. ^ Osaki, Tomohiro (2017-08-03). "Abe looks for rebound with make-or-break Cabinet reshuffle". The Japan Times Online. ISSN 0447-5763. Retrieved 2017-08-04. ^ a b Japanese Lawmaker Urges Asia-Centric Vision, Stronger Ties to Korea - OhmyNews International, 2 Oct. 2004, english.ohmynews.com/articleview/article_view.asp?menu=c10400&no=189925&rel_no=1. ^ . Japanese Lawmaker Urges Asia-Centric Vision, Stronger Ties to Korea - OhmyNews International, 2 Oct. 2004, english.ohmynews.com/articleview/article_view.asp?menu=c10400&no=189925&rel_no=1. ^ 隣国の肖像＜４＞脱「ロビー」　冷戦後の政治交流は. The Nishinippon Shimbun (in Japanese). 2005-01-23. Archived from the original on 2008-01-23. Retrieved 2017-10-18. ^ French, Howard W. (June 25, 2002). "Japanese Father and Son Share a Liver and a Political Rivalry". The New York Times. Retrieved May 24, 2010. ^ "KONO Taro". Liberal Democratic Party of Japan. ^ Carr, Adam. "2000 Lower House Election Single Member Districts". Adam Carr's Election Archive. ^ Carr, Adam. "2003 Lower House Election Single Member Districts". Adam Carr's Election Archive. ^ Carr, Adam. "Lower House Election 2005 SMD". Adam Carr's Election Archive. ^ Carr, Adam. "Lower House Elections 2009 SMD". Adam Carr's Election Archive. ^ Carr, Adam. "Lower House Elections 2012". Adam Carr's Election Archive. ^ Carr, Adam. "2014 Lower House Elections SMD". Adam Carr's Election Archive. Wikimedia Commons has media related to Tarō Kōno. This page was last edited on 28 March 2019, at 13:35 (UTC).